ww2dbaseOn 25 Nov 1944, US and Brazilian troops launched the first of several attacks against Monte Castello, a natural feature of 977 meters in height situated 61 kilometers southwest of the city of Bologna, Italy in the Upper Reno Valley. In Nov and Dec, the position exchanged hands, and heavy casualties were incurred on both sides. It was not until Feb 1945 when it was finally taken during Operation Encore. This campaign in northern Italy marked the first major action participated by the Brazilian Expeditionary Force. 25 Nov 1944 US and Brazilian troops attacked Monte Castello 61 kilometers southwest of Bologna, Italy. 26 Nov 1944 US troops captured Monte Belvedere and Monte Castello 61 kilometers southwest of Bologna, Italy; a subsequent German counterattack would recapture Monte Castello. 28 Nov 1944 German troops captured Monte Belvedere 61 kilometers southwest of Bologna, Italy. 29 Nov 1944 Three Brazilian battalions attacked Monte Castello 61 kilometers southwest of Bologna, Italy at 0700 hours. The poor weather precluded support from the air and by the attached three platoons of US tanks. The attack was repulsed by the afternoon. 5 Dec 1944 The Brazilian Expeditionary Force was given the order to capture Monte Della Torraca southwest of Bologna, Italy. 12 Dec 1944 Brazilian troops attacked Monte Della Torraca southwest of Bologna, Italy. 20 Feb 1945 US and Brazilian troops of US 5th Army launched Operation Encore against German positions at Monte Castello and Monte Della Torraca 61 kilometers southwest of Bologna, Italy. 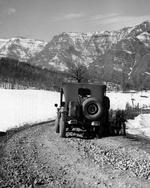 22 Feb 1945 US 5th Army ended the 4-day battle for the Upper Reno Valley in Italy, located between Bologna and Florence.